As you prepare to leave your job, you will also need to prepare for writing a good resignation letter. The resignation letter is your legal way to move out of the job, and leave the organization formally. Hence, you must write in full detail like the reason behind your resignation, notice period, last working day, etc. One may get confused while writing a resignation letter and may fall short of using the appropriate words in drafting the resignation letter. While you know what you have to write, it often gets difficult putting together the facts, and hence, the samples will be of great help. 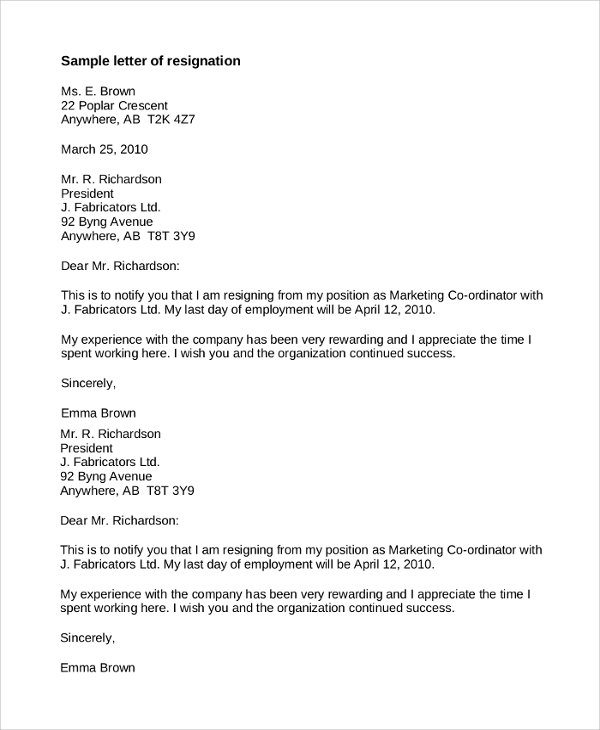 Take ideas from the Resignation Letter Format samples to get started. 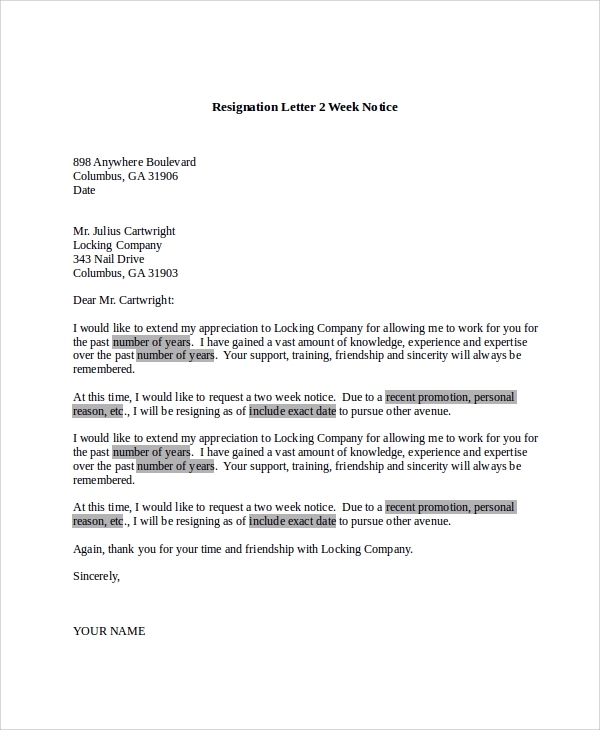 The resignation letter with a full notice of 2 weeks is needed when you have to give a two-week notice, and you may use this ready format to get ideas. 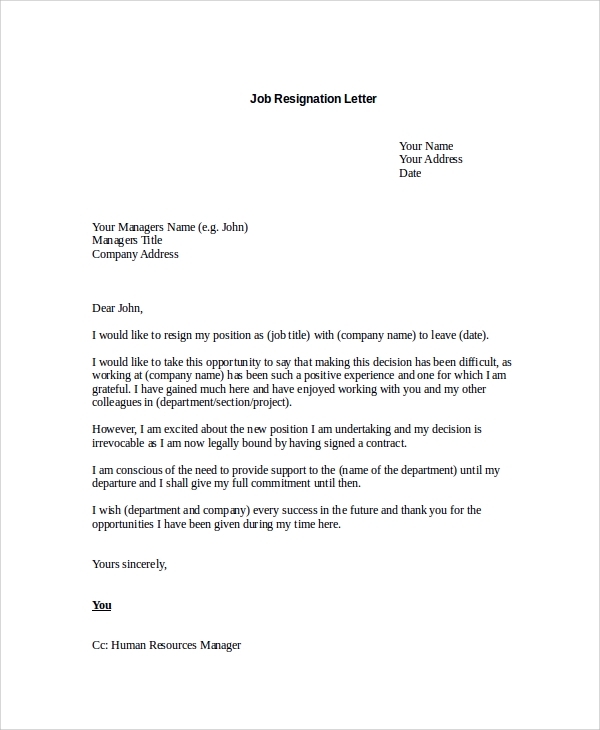 The job change resignation letter is what you will need when you resign, and at the same time mention the reason behind your resignation is a change of job. After resigning from this organization, you will be joining some other company. 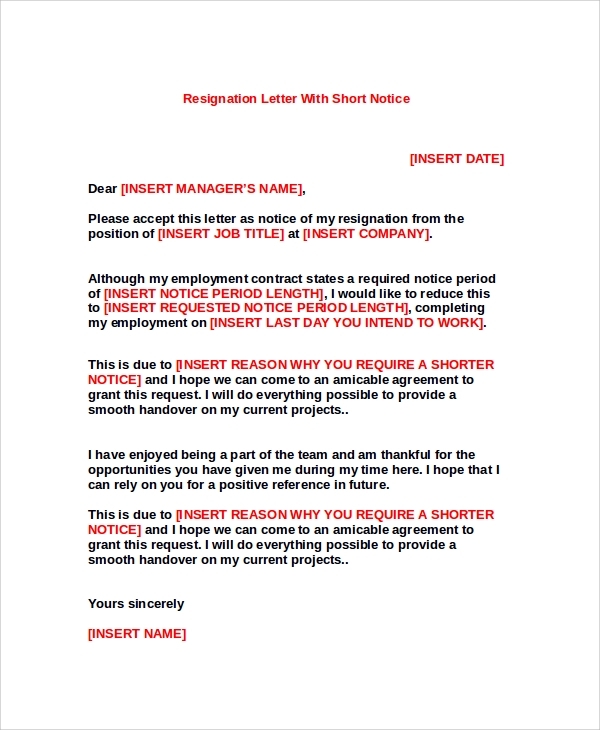 A short notice resignation letter is especially necessary when you need to resign in a short notice, and you don’t have enough time to serve a notice period. 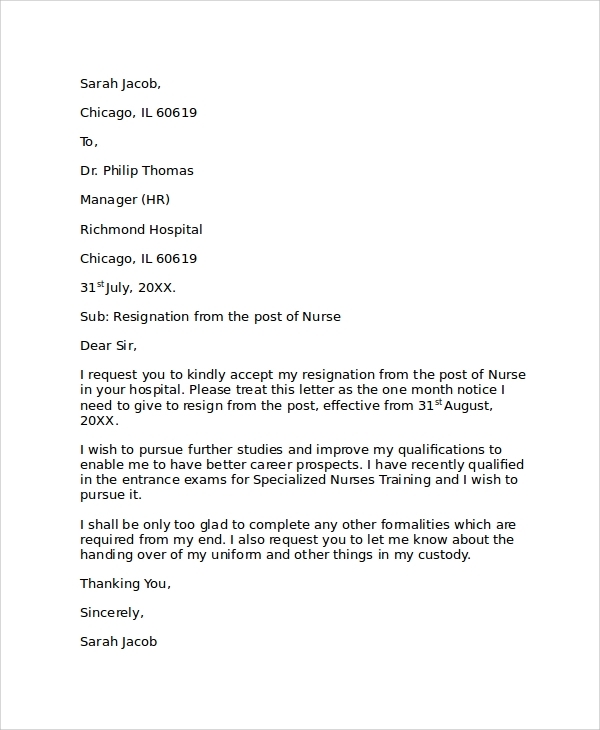 Nurses do resign from their job, and they also need a resignation letter format. 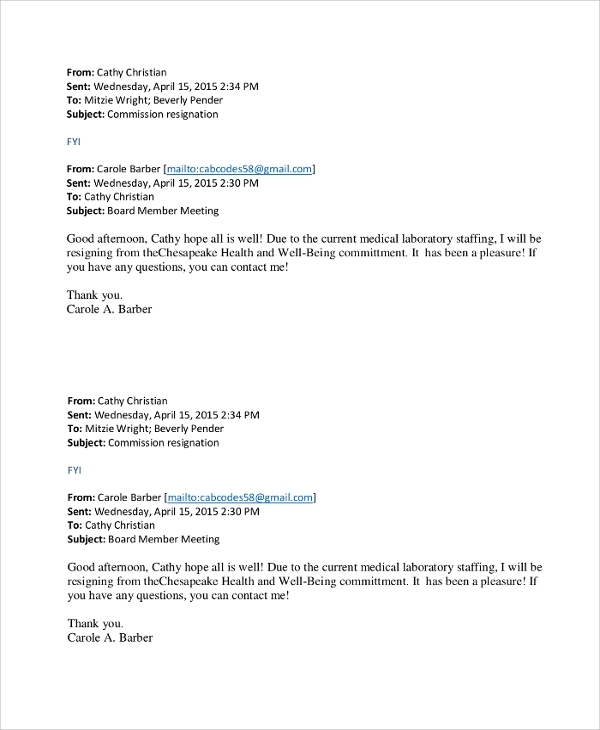 Moreover, nurses require a format for being sure that they are presenting the letter in a proper official tone. When you are going to state purely personal reasons for resigning, then this format can be followed. The personal problem or reason initiated resignation has this format. When Do You Need A Resignation Letter? The need for a resignation letter arises when you are going to resign from a job, or leaving a job. Leaving a job comes with much responsibility, as you have to tell the organization which has been dependent on you to work in a particular position, that you will no longer be available for the service. Here, you have to tell them about the intended notice period when you will still be serving them after giving the Resignation Letter. Besides, you need to provide them with a valid reason for resigning too, so that your employer accepts your resignation. Hence, the need for a resignation letter is prime as you have to resign and serve a formal notice period. The importance of resignation letter samples is quite high in helping people from various domains as it helps them understand the letter writing format better. You have to be clear about what you have to say. If any reason, clause, request, etc. stays cloudy and gets misinterpreted by the employer just because of the problem of presentation and wrong choice of language and style, then you may get into trouble. Hence, it’s best to make an excellent impression on the employer even when you are leaving the company by writing a nice resignation letter which is formal, professional, and perfect. 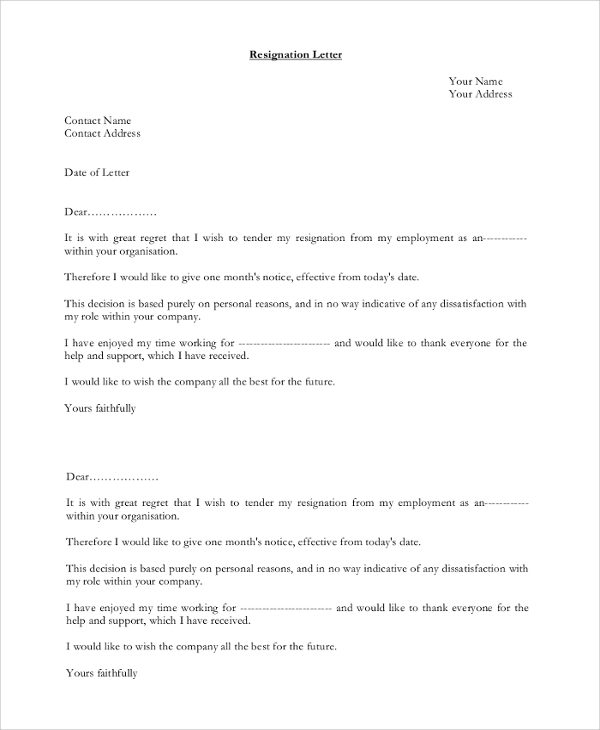 If you are all set to resign from your job and need to refer to the Resignation Letter Examples, then the best place is the template banks you get online. Here, you will get helpful content, and the best resignation styles specifically made to suit various domains, and also for the general purpose. Get sample retirement resignation letters and more styles here.